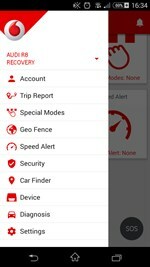 Installing a Vodafone Protect & Connect tracking system automatically gives you access to our connected car services* through Vodafone Automotive’s own mobile and web application. With My Connected Car, you can access and manage a number of your vehicle security and safety functions remotely. My Connected Car provides easy access to vehicle information such as real-time vehicle location, directions to the vehicle and geofence ability. Please see the key features below:. Download the My Connected Car app from the app store on IOS and Android now for a free demo. MOTORHOME AND CARAVAN OWNERS GET UP TO 25% INSURANCE DISCOUNT – WHEN YOU FIT VODAFONE PROTECT & CONNECT THATCHAM ACCREDITED SYSTEMS. ONLY WITH CARAVAN GUARD INSURANCE. Fit Vodafone Protect & Connect 6 and get a massive 25% insurance discount for your motorhome or 15% insurance discount for your caravan – just by fitting Vodafone Protect & Connect 6. Only through Caravan Guard. Click now for a QUOTE. Packages available include Vodafone Protect & Connect 6 with a great value 5 year subscription. Whether it’s touring caravan insurance, motorhome insurance, trailer tent or folding camper insurance you are looking for, Caravan Guard have over 10 years experience offering reassuringly good cover at a surprisingly low price. Great insurance savings for careful and claim free caravan and motorhome owners. A 24 hour claims line is available, and around 85% of customers rate this service as either exceptional or above average. The winners of numerous awards for their caravan and motorhome insurance policies and superb customer service. Leading caravan and motorhome dealers use Caravan Guard services for their customers with confidence. They are also involved with many of the leading caravan andmotorhome sites on the web. All Caravan Guard insurance policies come with the reassurance of a 14 day money back refund provided no claims have occurred in those 14 days.